John Legend arrives at Night 2 of the Creative Arts Emmy Awards at The Microsoft Theater on Sunday, Sept. 9, 2018, in Los Angeles. 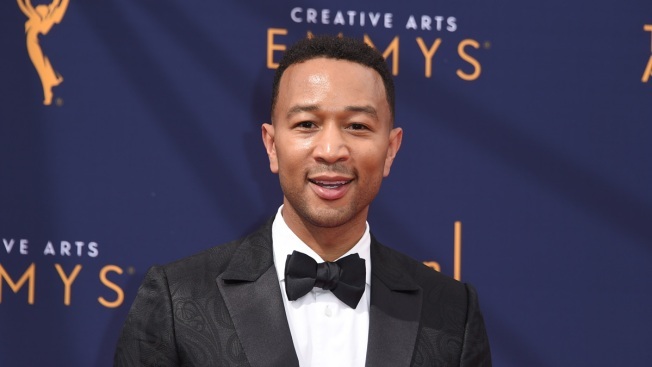 NBC's live version of "Jesus Christ Superstar" has won an Emmy Award and that has made three men extra happy — it means star John Legend, composer Andrew Lloyd Webber and lyricist Tim Rice have joined the elite squad of EGOT winners. The musical's win for best live variety special on Sunday means Legend, Lloyd Webber and Rice have Emmys to go with their Tonys, Grammys and their Oscars — the four biggest prizes in show business. Lloyd Webber and Rice have already won Tonys ("Evita" and "Sunset Boulevard"), Grammys ("Cats," ''Evita") and an Oscar for "You Must Love Me" from "Evita." Legend has won 10 Grammys and in 2015 he scored an Oscar for his song "Glory" from the movie "Selma." Last year, he won a Tony for Best Revival of a Play as a co-producer of "Jitney." Legend, who played Jesus in the concert version of "Jesus Christ Superstar" but won his Emmy as a co-producer of the show, is also gunning for an acting Emmy later this month. Two other songwriters were also one Emmy away from the EGOT on Sunday — Benj Pasek and Justin Paul, whose song "In the Market for a Miracle" appeared in "A Christmas Story Live!" They previously won an Oscar for "La La Land," and a Tony and a Grammy for "Dear Evan Hansen." But their bid for EGOT status was derailed when the Emmy for Outstanding Original Music and Lyrics went to "Saturday Night Live" and their song "Come Back Barack" when Chance the Rapper was hosting. The latest award caps a special year for Lloyd Webber, who turned 70 this year and whose autobiography, "Unmasked," came out in the spring along with a massive, four-CD collection of his songs performed by the likes of Barbra Streisand, Lana Del Rey and Madonna. He was the subject of a Grammy Awards tribute, and winter Olympic fans would have noticed Lloyd Webber soundtracks for several skaters. "Jesus Christ Superstar Live In Concert" beat out the telecasts of the Grammys, the Oscars and the Golden Globe, as well as the benefit show "Night of Too Many Stars" on HBO. Anthony Bourdain also won six posthumous Emmy wins for his show "Anthony Bourdain: Parts Unknown." The show won the Emmys for best informational series or special, writing for non-fiction program, picture editing for a non-fiction program, sound editing for a non-fiction program and sound mixing for a non-fiction program. Bourdain personally won two Emmys, one for writing and one for best informational series or special.